← Arrest the “Reply All” scourge! Getting back to the game, the press has commented extensively on the referee’s performance at scrum engagement and I think it is fair to say that the scrums turned out to be extended, boring, and unproductive. The referee might be criticized for not being able to communicate his requirements to the players but the players, especially the Irish team in the first 60 minutes, deserve criticism for not taking action to avoid the 3 penalties and 4 free kicks that were awarded against them. However, scrums weren’t the only uninteresting phase of play in this game and nothing much appealed to the eye. In addition, players are professionals and you’d expect them to be able to work out how to avoid sanctions after the first couple of free kicks/penalties. During the game, the first Irish try was the product of some pretty turgid pick and drive play; the second was a nice example of taking advantage of your opponent when they disengage their brain after a penalty award close to their line; Samoa scored the best try with a neat cut-in and excellent line through the Irish defense. 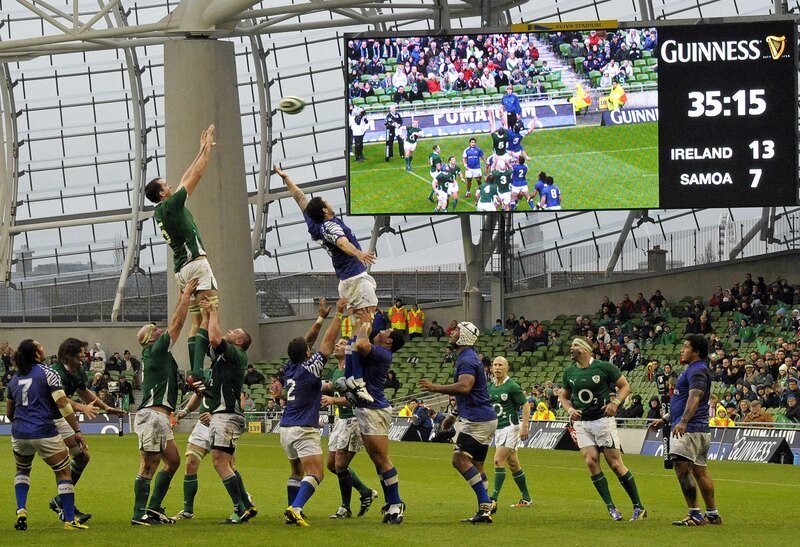 After that, line-outs provided the highlight of the game… so you can understand that not much was going on. As there wasn’t much to interest the rugby purist on the pitch, I took a couple of photos to illustrate the view from Row E. The photos were taken with a Nikon D700 camera equipped with a 24-120mm zoom. The first shot is of Devon Toner winning a line-out on the Samoan 22m in the first half. This was Devon’s first cap and he did a good job of winning ball. This shot shows Brian O’Driscoll forcing a 5m attacking scrum by causing Samoa to touch down behind their own line. There is quite a variety of seats and viewing positions in the Aviva Stadium. Some are “in the Gods” and far removed from the action. Others like the one we had in Row E are close to action when it happens at the South End but totally remote and detached when play goes to the North end. The best seats in the house are naturally in the middle of the pitch in the lower East and West stands. 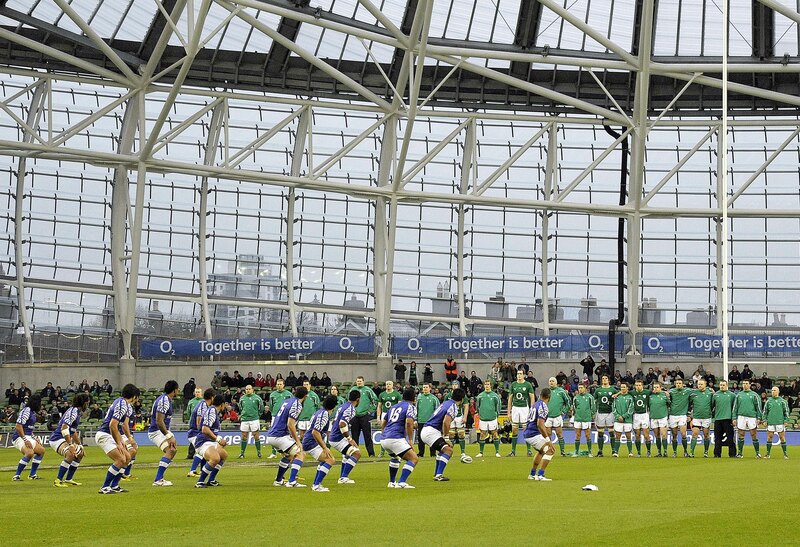 The last shot shows the Irish team lined up to receive the Samoan challenge before the game. Not quite the New Zealand haka, but worthwhile seeing all the time. Saturday’s game was a disappointment, but tonight everything is reset as I’m in Limerick for the Munster vs. Australia game. It’s good to see that touring teams are still willing to play non-international games outside the major centres and I am looking forward to seeing how an admittedly weakened Munster squad (many of their top-line players are in the Irish team preparing for the game against New Zealand on Saturday next) play against the “green and gold”. This entry was posted in Rugby and tagged Aviva Stadium, Ireland, Ireland rugby, Lansdowne Road. Bookmark the permalink. The view from row s behind you was much the same.